The Singapore government has hailed small and medium sized enterprises (SMEs) as being the driving force behind its economy, saying they make up 99 percent of all enterprises in the country and employ 65 percent of the country’s workforce. Despite approximately 219,000 of them contributing SGD196.8 billion (US$142.3 billion) in gross value added to the economy – according to Singapore’s Department of Statistics – SME’s continue to face tough challenges. Aside from tough competition from larger corporations and rising costs due to wages growing faster than inflation in Singapore, limited access to financing is also an obstacle for many SMEs in the country. A recent study concluded that about four out of five Singaporean SMEs do not qualify for business financing. The CPA Australia Asia-Pacific Small Business Survey found that over the past four years, Singapore's SMEs have had difficulty obtaining financing. In 2017, only 18 percent of SMEs reported finding it "easy" to obtain financing. This figure is the lowest since 2014 when 30.9 percent found it easy to obtain financing. In 2015, 34.1 percent found it easy while that number dropped in 2016 to only 24.5 percent. However, with the advancement of technology, it seems that SME’s do have an avenue to address finance-related issues by improving efficiency through the use of modern-day tools. Oracle Asia Pacific senior vice president François Lançon suggests that SMEs take advantage of cloud tools in particular. Lançon said that not only can cloud solutions help increase efficiency, but with technologies like embedded automation and artificial intelligence (AI) as part of this toolset, businesses can better manage their costs. He said that new cloud tools also have the power to help SMEs really change the game in terms of their human resource and talent practices. “Better insight and processes can help them make better hiring decisions and work out how to provide greater reward and faster career progression, as well as a more engaging and fulfilling work environment,” he added. 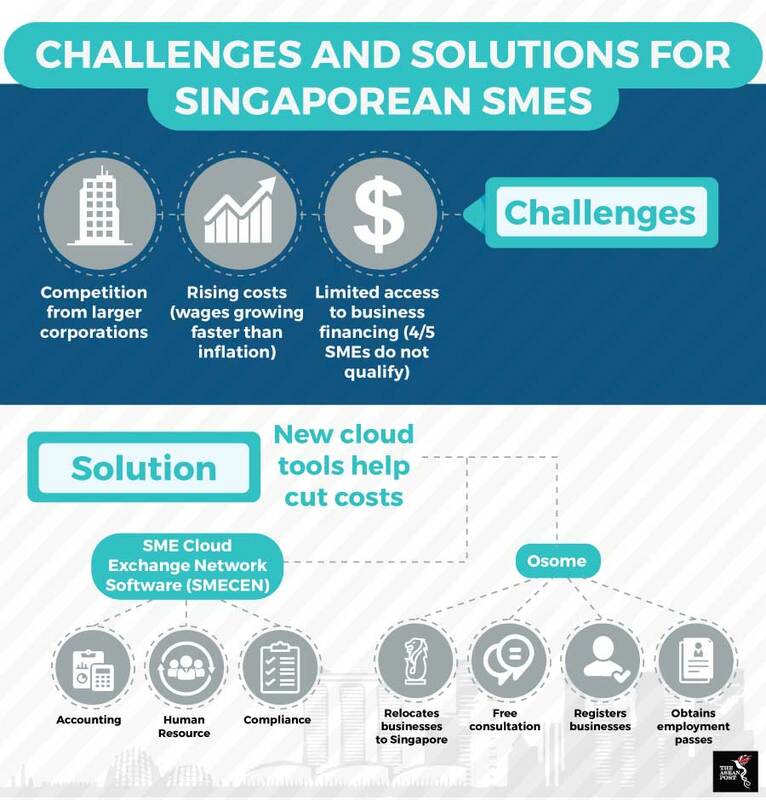 One such cloud-tool is the SME Cloud Exchange Network Software (SMECEN) which was launched on 20 July this year by the Association of Small and Medium Enterprises (ASME) and supported by Enterprise Singapore, the Accounting and Corporate Regulatory Authority (ACRA) and the Inland Revenue Authority of Singapore. Working with statutory boards to understand SMEs’ challenges and needs, the ASME noted that SMEs have faced rising compliance costs, having to stay in line with legislative and statutory requirements such as the filing of financial statements via XBRL (extensible business reporting language), mandatory annual returns and tax forms, as well as the issuing of itemised pay slips and proper employment contracts. SMECEN is an integrated suite of solutions, offered on a software as a service (SaaS) basis to facilitate SMEs' compliance while also giving them oversight of their finance and tax position. In a media statement issued last month, ASME said that firms adopting the software "will see an increase in overall productivity and lowered costs and be well placed to develop management competencies powered by digitalisation of administration". Using the software, firms can generate financial statements, corporate tax computations, as well as goods and services tax and corporate tax returns using standard report templates that draw on existing accounting data. When filing financial statements with ACRA, firms can also generate financial statement highlights in the required XBRL format. Released earlier than SMECEN, mobile-app Osome by Osome Pte Ltd has been available since 11 December 2017. Osome provides different services than SMECEN. While SMECEN is targeted at accounting and ensuring companies are compliant, Osome provides free consultations; makes registering businesses easy; does the companies’ accounting, taxes and payroll, and secretarial services; and helps to obtain employment passes and relocation to Singapore. Up to date, the lightweight, easy-to-use app has already been updated to version 3.0.1 and more than 10,000 mobile phone users have downloaded the app. While there is no doubt that there are numerous challenges for SMEs, newer ones will likely emerge as Singapore ushers in Industry 4.0. SMEs should take the opportunity to look into implementing more efficient and cost-effective tools to help them run their businesses. As new and more advanced tools continue to emerge - especially in ASEAN’s most technologically-advanced country – there’s a higher likelihood that SMEs adopting them will be the ones to prosper.